Human Fibroblast Conditioned Media (TNS®) - A physiologically balanced, naturally secreted and stabilized growth factors blend that helps improve the appearance of fine lines, wrinkles and overall skin tone and texture. Hydroxypropyl Bispalmitamide MEA (Ceramide) - Skin barrier agent that promotes and maintains the moisture mantle of the skin and improves the skin texture by emollient and moisture-retaining effects. Palmitoyl Oligopeptide - A synthetic tripeptide designed to help reduce the appearance of fine lines and wrinkles. A: After procedures, it’s best to consult your physician, but generally TNS Ceramide Treatment Cream can be used morning and night until all irritation and dryness has subsided. 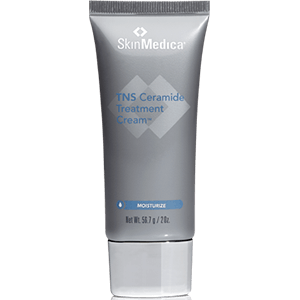 If you are using TNS Ceramide Treatment Cream as a daily part of your skin care regimen there is no limit to the amount of applications. A: This product contains TNS, peptides and a patented Ceramide technology to rapidly hydrate and help restore your skin’s natural barrier function.